Bombers - 1st Inning: Rob Ninfo singles to center and steals second. Tyler Hauptman singles to right. Ninfo scoring. Hernan Cortez follows with RBI double to left. Martin Saeger hits an RBI single. Ritchie Benson hits an RBI double to left. Matt Saeger singles. Nick Fries is hit by a pitch. Josh Marx hits a 2-run double to left. Bombers get 7 runs on 7 hits, 1 Quake error and they leave 2 on base. 7-0 Bombers. 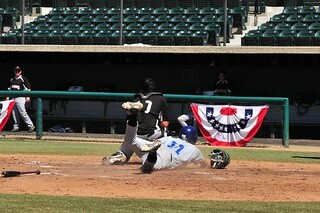 Quakes - 2nd inning: Cory Wertz doubles to right and steals 3rd. Beans Curiel grounds out; scoring Wertz. Quakes get 1 run on 1 hit, and they leave a man. 7-1 Bombers. Quakes - 3rd inning: Matt Alvarado singles to left. Shoki Hioki reaches base on a fielding error. Maxwell Thomas hits an RBI single. 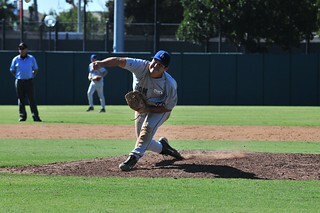 Quakes get 1 run on 2 hits and leave 1 runner on base. 7-2 Bombers. Bombers - 5th inning: Nick Fries reaches base on a fielder's choice and scores on an error. Bombers get 1 run on no hits and a Quake error; and they leave 1. 8-2 Bombers. Quakes - 5th inning: Michael Preski walks. Mark Wilkinson and Shoki Hioki reach base on fielding errors. Maxwell Thomas and Lucciano Aguirre draw walks. Cory Wertz hits a 2-run double. Dirk hits a 2-run double. Quakes get 6 runs on 2 hits; with 2 Bomber errors and they leave 1 on base. Game tied at 8. Bombers - 7th inning: Martin Saeger singles to left. Richie Benson singles to right. Matt Saeger walks. Nick Fries reaches base on a fielder's choice with a run scoring on the play. The Bombers get 1 run on 2 hits, no errors and they leave 2. 9-8 Bombers. Bombers - 8th inning: Tyler Hauptman singles to left. Hernan Cortez singles to right. Martin Saeger hits an RBI single to left. Matt Saeger hits a 2-run single to left. Bombers get 3 runs on 4 hits with no errors and they leave one on base. 12-8 Bombers. Bombers - 9th inning: Rob Ninfo is hit by a pitch. Tyler Hauptman reaches base on a fielder's choice and later scores on a wild pitch. Bombers bet 1 run on 1 hit and 1 Quake error and they leave 2 on base. Congratulations to the 2013 PCBL Single-A Champion Bombers! Bombers - 1st Inning: Rob Ninfo singles to left; then steals 2nd and 3rd soon after. Tyler Hauptman walks. Brian Rapf grounds out; scoring Ninfo. Bombers get 1 run on a hit and they leave a man on. 1-0 Bombers. Bombers - 3rd inning: Robert Ninfo singles to left center. Tyler Hauptman singles to right. Hernan Cortez reaches base on an error; with a run scoring on the play. Hauptman and Cortez steal 2nd and 3rd respectively. 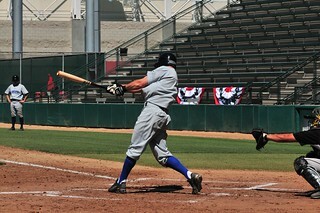 Martin Saeger grounds out; scoring a run. Bombers get 3 runs on 2 hits and an error; leaving nobody on base. 4-0 Bombers. hile leaving a man on. 4-2 Bombers. Bombers - 5th inning: Dave Malver walks. Robert Ninfo reaches on a fielder's choice. Hernan Cortez hits an RBI single to the left side. Brian Rapf singles to le ft; scoring 2. Bombers get 3 runs on 2 hits and no errors; leaving 1. 7-2 Bombers. Bombers - 6th inning: Andrew Martino singles to left. Joe Blink walks. Robert Ninfo hits an RBI single to left. Bombers get 1 run on 2 hits and no errors; leaving 1. 8-2 Bombers. Congratulations to the 2013 PCBL LA/OC World Series Champion Bombers!